Happy Monday everyone! I hope you all had a relaxing weekend and feel ready for the work week ahead. Whenever I need an energy boost for my work week *cough* most Monday mornings *cough* I pick out brighter than usual wear to work outfits. Starting your work week off with a 9 to 5 outfit that makes you smile is one of the best ways to make your Monday just a little brighter. 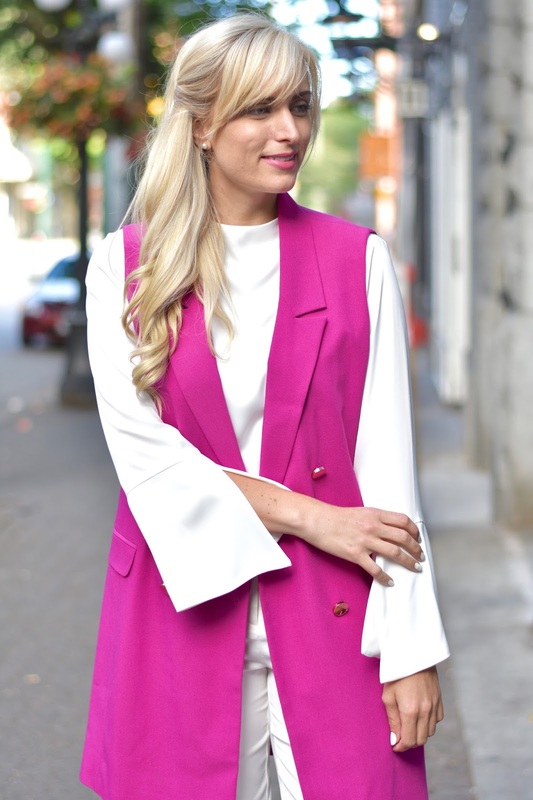 When I saw this pink sleeveless blazer I knew instantly this would be a perfect Monday morning item! 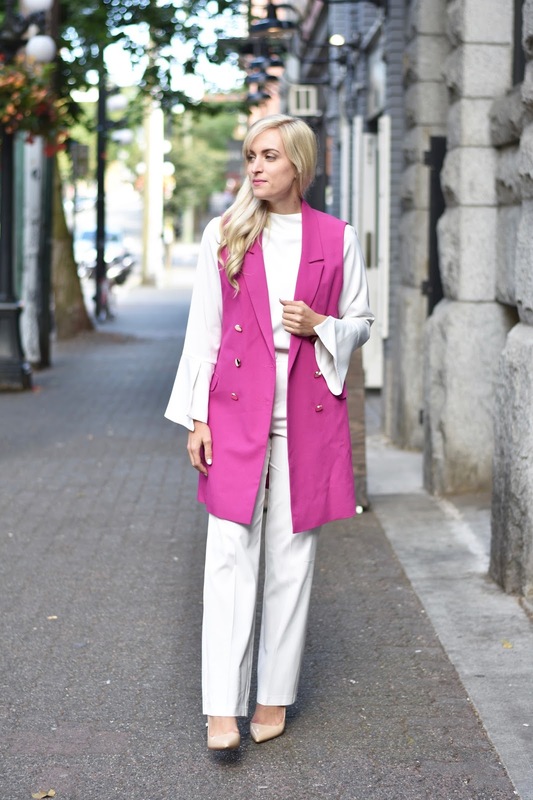 In order to squeeze every last bit out of the summer weather and summer fashion I wanted to style this pink blazer in a way that felt appropriate for a summer’s day at the office. To do so, I went with an all white look. These white wide leg pants have quickly become a summer office wear staple (get yourself a pair now for the last month of summer weather!). The white top is new, and I picked it up because I just love the only slightly bell sleeve shape. The small slit in the fabric from wrist to mid-forearm gives the sleeves a bell sleeve, draped look when you move. It’s an easy update to a basic white wear-to-work shirt! I also like that it shows off your wrists more than most office wear items- so it’s the perfect excuse for a statement bracelet or watch. "#GirlBoss | Interview with Ally (Photographer)"
That is such a cool vest!! I love the pop of pink on you! What a great statement for work! 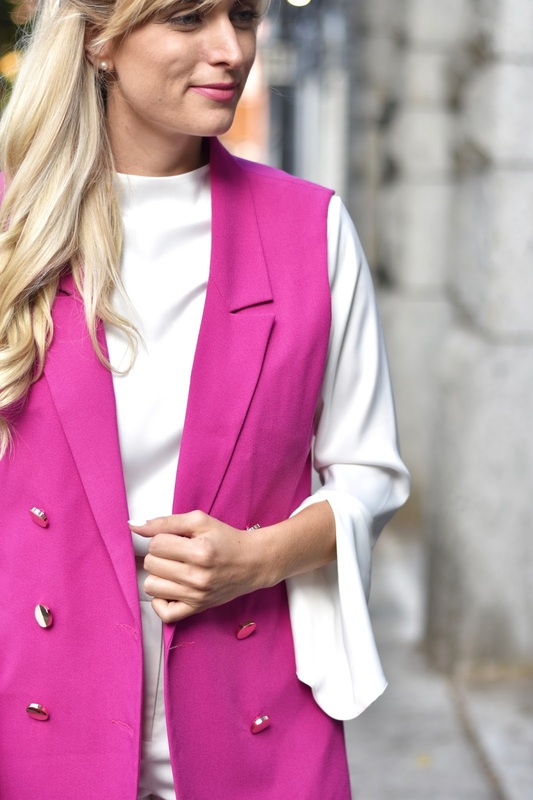 I love the bright pink vest! Thank you so much! So nice to add a pop of color!